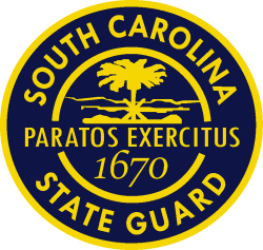 SOUTH CAROLINA MILITARY SUPPORT FOUNDATION, INC. 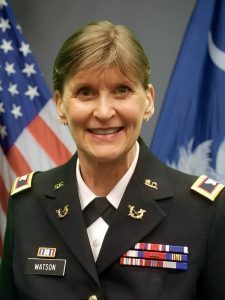 ACHIEVEMENTS: South Carolina Military Department Meritorious Service Medal, 04 Jan 2011; S.C. State Society DAR Public Relations Award 2011; South Carolina Joint Services Detachment , Frank P. Whitlock Award, 23 Apr 2016; Military Proficiency Ribbon (Gold Torch Device) 07Feb 2007; The Medal of Honor: A Commemoration of SC Recipients (Editor) awarded Top 10 most notable SC State Government Documents of 2004; MidlandsBiz spotlight 2014, 2011. DISTINCTIONS: Lieutenant Governor Palmetto Patriot award; State DAR Award – South Carolina Chapter; Faculty, Congress of Fellows of the International Legal Studies; University of Michigan, Ross School of Business Executive Program; South Carolina Supreme Court Compleat Lawyer Award; Columbia College Career Achievement Award, Tribute to Women in Industry Award, Columbia College Commencement Speaker, Leadership South Carolina, Order of the Purple Seal (Scholastic Society), Alpha Kappa Gamma (Honorary Leadership Fraternity), Ariail Scholar, Sigma Tau Delta Scholar, Columbia College Trustee Scholar; Editor, Criterion Literary Magazine. AFFILIATIONS: Transportation Law Section, Vice President – Communications Committee; Claflin University, Board of Trustees – Secretary; Columbia College Board of Visitors, Past Chairman; Junior League of Columbia; International Rotary Club – Columbia, SC Chapter; South Carolina Bar Association; South Carolina Joint Services Detachment, South Carolina Military Department, past member; S.C. Military Support Foundation, Member and Board Secretary; South Carolina State Guard, Public Affairs Officer, rank COL; United Methodist Church-Volunteers in Missions; Washington D.C. Bar Association.